Elnet Technologies Ltd. is in portfolio of Subramanian P. He is one of the top investors in India. It is Infrastructure services company. It provides infrastructure services to Software and BPO (Business process Outsourcing Companies). As per the Company website it was incorporated in August 1990 as a Public Limited Company promoted by Electronics Corporation of Tamil Nadu and Stur Technologies Pvt Ltd (formerly New Era Technologies Private Limited) & its Associates. The main business of this company is to develop and manage Software Technology parks. Elnet Software City is located in a 3.16 acres plot in Taramani adjacent to TIDEL PARK along the IT corridor. The company has plans to expand the infrastructure and accommodate BPO services as well. This expansion will result in more revenue with time. Long term price chart of the Company shows two big buildings with good gap in between. It is related to IT industry in one way. 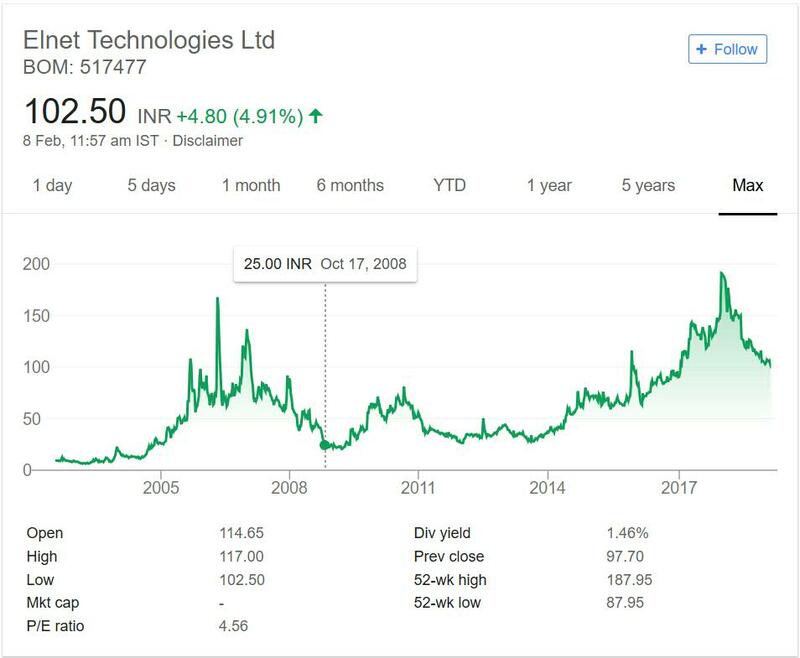 The company gave good 15 times return from year 2002 to 2007 that is 5 years. It went from 9 odd levels to above 100 levels. This was boom time for IT players and BPO players. After global crisis of 2008 the stocks crashed. It never went below starting level of 2002. This verifies the claim of 100% occupancy which Company states on the website. On an absolute terms Company has given more than 10 times return in past 1 years with healthy dividend of more than 1% at current market price. So any one invested in year 2002 is getting 10 times dividend and has 10 times return on his investment. Elnet technologies limited is not IT BPO sector Company. It is service provider to these companies. The revenue of Elnet is directly proportional to occupancy of its Software Technology park. It is expands its parks and they get occupied then it will generate revenue. It is a profit generating dividend paying Company. Tamilnadu has good presence of IT companies and it is expanding with time. This fact will help company. Growth in IT companies and BPO industry is trigger for it. If those companies will expand they will look for office spaces and infrastructural support. This is where companies like Elnet Technologies will come into picture. There fortunes are directly proportional to growth in these sectors. However they are least impacted by recession in these sectors. It will feel heat if problem becomes too drastic which is highly unlikely because Indian IT industry has matured. Based on past performance also it seems to be stable company. But problem is there is no much growth projected in future. Current software park is already running at 100% occupancy. The only way to grow is to launch a new part or do major expansion in already running one. For now I am not tracking this company as there are better safer alternatives present in market.